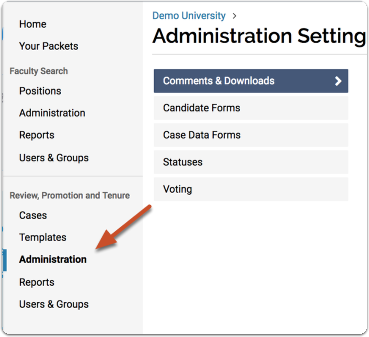 Administrators in Interfolio Review, Promotion & Tenure can create two kinds of forms; candidate forms and case data forms. 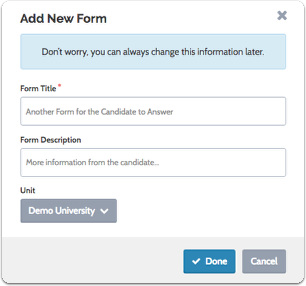 Candidate forms are designed to collect information directly from candidates and are completed as part of a candidate's packet requirements. 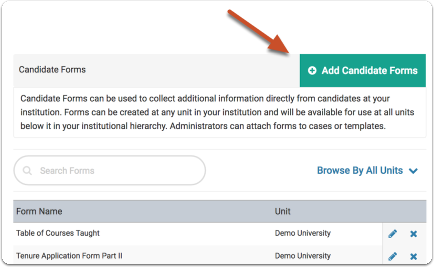 Candidate forms can be created at any unit in your institution and will be available for use at all units below it in your institutional hierarchy. 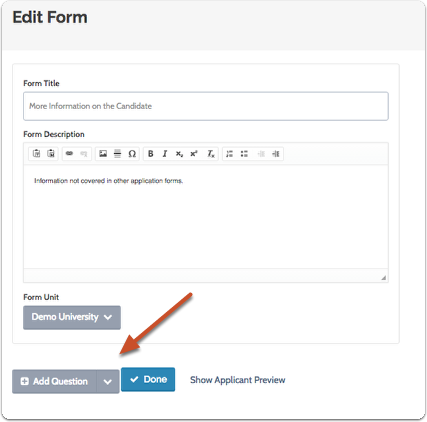 Candidate forms are created from the Administration Settings page. Once a form has been created, Administrators can attach it to cases or templates to which they have access. 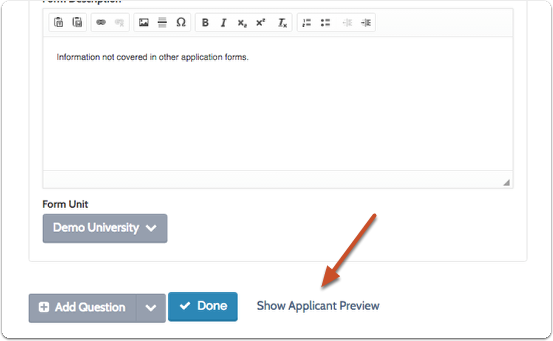 This article explains how to create a new candidate form in Interfolio Review, Promotion, & Tenure. Please note that creating and adding a form are not the same process. Forms are created from the Administration page, but are attached when creating or editing a template or case. 3. Click "Add Candidate Forms"
Note: The form will be available for units at or below the parent unit you select. 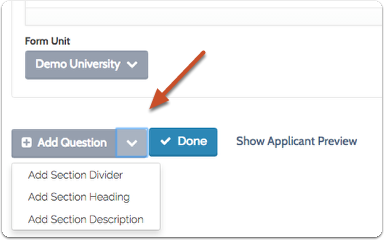 Provide applicants with an entire text box for their answer.Best suited for longer, paragraph-form responses. Presents applicants with multiple answer choices, of which they can choose one. This type of question can also work for True/False, Yes/No, and other binary questions. 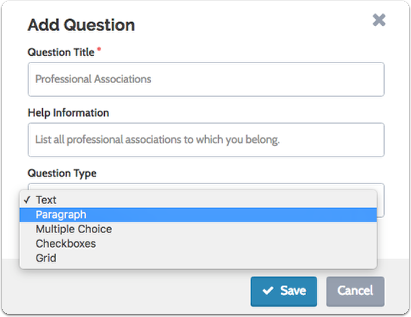 You can also provide applicants with a box for "Other," where they enter their own answer. 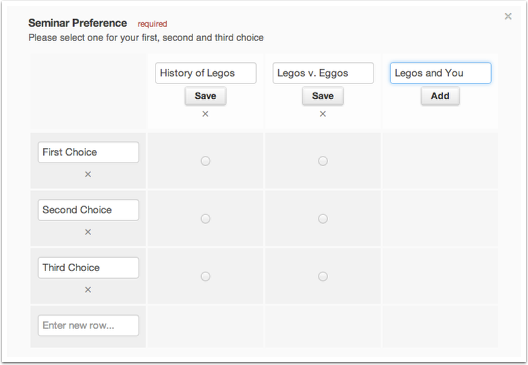 Presents applicants with columns and rows, of which they can select one option per row. This type of question can be used to express preferences, e.g., which courses the applicant would like to teach. 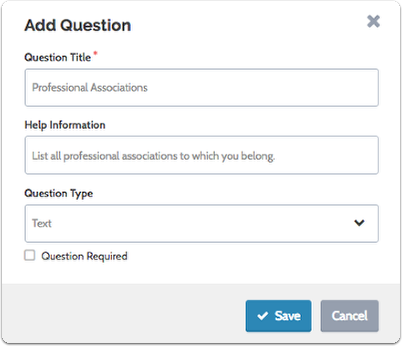 To add form elements click the dropdown menu beside the "Add Question: button and select a formatting element.